High Handicappers/beginners often get neglected by the Golf bloggers when it comes to listing down popular golf drivers, so I just thought of writing down this piece to help them with best golf drivers for high handicappers with a detailed analysis of most common drawbacks in their game and how a good driver can help elevate their driving prowess on the range. its often argued that Fairway woods are better suited for high handicappers to their shorter shafts. Yet when it comes to hitting off a long tee, there can be no better option other than a good golf driver. Modern drivers tend to be hugely forgiving and there are many wonderful super game improvement clubs that both casual golfers and high handicappers can choose from these days. If you are willing to spend a bit of money, there is no good reason for you not to buy a golf driver for your game. Wilson Staff Men’s D200 Driver is manufactured with a focus on it having the right weight rather than simply getting the driver to be lightweight which seems to be a wise decision, as lightweight alone cannot guarantee a good performance out on the course. The weight distribution is one that needs to be extremely well balanced in all the correct places if you are to get the maximum distance in your swings. The Wilson Staff Men’s D200 Driver is perfect for a beginner with all the extra weight being shaved off to increase the shaft length. An adjustable hosel has been added to the driver making it a club that is far more versatile in comparison with its peers with the loft range being situated between 8 and 14 degrees. If you are interested or willing to spend a bit of extra money and want to try out the new variants that are there in the market, then buying a golf driver like the D300 can also turn out to be a good idea. The driver is characterized by reactive face technology which improves ball speed as well as the distance on shots. Has a sophisticated old school look that is certain to go down well with most golfers. The Wilson Staff Men’s D200 Driver is definitely a good golf club driver for high handicappers because of its flexible and correct weight, making it a club that is quite easy to swing. While there is plenty disadvantage associated with the distance and the impact sound can hardly be heard or felt, the fact that this is a driver that comes with high forgiveness levels and that it improves ball speeds makes it a great driver for any beginner a the game of golf to own. 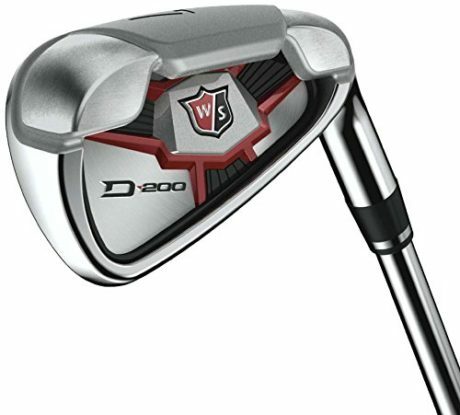 The Wilson Staff Men’s D200 Driver is easily available for sale online and can be procured for a fairly decent price. If you are a golfing beginner who is willing to spend a bit on the purchase of a golf driver then this would be the correct product for you to buy. It will give you full value for the money you spend on it and will serve you for a long time to come as well. The TaylorMade AeroBurner Driver is perfect for use by high handicappers and has a significantly long history of its own going back to the very first metal drivers that were created by the TaylorMade Company. The name has been resurrected quite a few times over the years and the latest version of the driver better than what the original metal version was. The driver is characterized by a striking white colored cover that has red alignment aids and it is a product that has been designed with the clear intention of it standing out in a golf course. The club head is one that is quite wide and the driver has a very deep speed pocket as well. It is one of the golf drivers that you as a high handicapper could use in order to improve your game. Most of the adjustable features that are found in other drivers can be seen to be missing in the TaylorMade AeroBurner Driver. This is a good thing as the adjustable features are never really needed by high handicappers and beginner level golfers anyway. The adjustable features can in fact be quite a nuisance and are even capable of slowing down your game, so a driver that doesn’t have such features is certainly one that is worth making use of. This is a driver that is available in lofts that range from 10.5 degrees to 14 degrees. This is a driver that is characterized by a high level of accuracy that is capable of turning slices, hooks and mishits into fairly decent shots. The feedback and the feel on impact are quite hot, thus making this driver one that is quite fun to hit. As a high handicapper or as a beginner in the game of golf, you need a high handicapper driver for beginners that is not only easy to use but which also helps you to improve your game considerably. The TaylorMade AeroBurner Driver has been designed to really make your game out on the golf course far easier than usual. It is characterized by a vibrant and sophisticated appearance and has the capability of turning mishits and slices into fine shots. 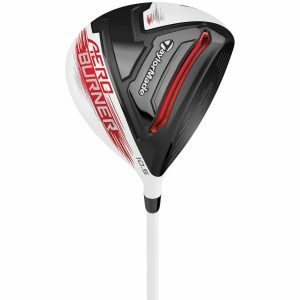 Also if you like your shots being as high or as airborne as possible, then the TaylorMade AeroBurner Driver is definitely the perfect golf driver for you to own and use. The absence of adjustable features makes the driver all the more worthy of being owned and used by a beginner. Callaway is famously associated with the launch of the first and original Big Bertha golf driver in as early as 1991. The V Series tends to be the third or the fourth driver in this recent iteration of Big Bertha. This driver is bigger in size and a lot more forgiving than many of its peers in the market. The head of the club is quite large and holds a cartoon of the physicist Isaac Newton thus alluding to the fact that there is plenty of physics going in this driver’s favor. The letter V in this V Series is one that stands for the term velocity. The makers of the driver have made considerable efforts in trying to increase the velocity of this driver by bringing about a reduction in its weight. This is also a golf driver that features an Optifit hosel that is capable of changing the loft angle by a few degrees either way. Callaway has also made use of a highly forged composite head in order to keep things as light as possible while also still sporting one 460 cc club head on this Big Bertha V Series driver at the same time. 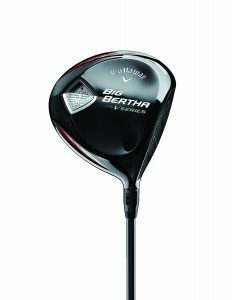 The driver is characterized by a shiny black finish that adds plenty of style to it and makes you forget that this driver is something but an improvement of the original Big Bertha series. The Callaway Big Bertha V Series Driver is ideal for use by any beginner level golfer or one who has a high handicap. It has amazing levels of forgiveness that allows you to take some great shots and feel hugely confident when you do so. The adjustable hosel feature also aids you with your golfing game and the amazing sleek black appearance makes it a driver that you could be really proud to own and use when out on the golf course. While the impact sound isn’t too great and may tend to make your game a little boring, the fact that this is a golf driver that is illustrated by a cute Isaac Newton cartoon can give you plenty of laughs when using it. As a high handicapper out on the course for a casual game of golf, this driver would certainly be great to put to use. The club head of a driver that is used by a high handicapper should be marked at 460cc. It is the shape of the club head that will play a vital role in determining the level of forgiveness that is on offer. Usually perimeter and weighting designs create wide and shallow club heads, with the weight being dispersed to either side of the club head. The shaft of the driver that is being bought by a beginner should ideally be one that is made of graphite. Graphite shafts tend to be hugely flexible and when you end up swinging the shaft it bends slightly and creates what may be termed as a whiplash effect, thus increasing the swing speed upon impact. An Ideal golf drivers for high/mid handicappers is often characterized by features like adjustable lofts and moving weights which allows one to tweak the dynamics of the club in order to suit individual golfing requirements. However, you need to remember, that as a beginner in the game you don’t really get to benefit from such advanced features and if you fool around with them a bit too much, you might find the club a lot harder to hit with than usual. The loft angle for a high handicapper should be one that is well over eleven degrees especially if your swing speed is one that is really low. A loft angle that is less than nine degrees can be maneuvered well enough only by the better players and is definitely not well suited for a high handicapper. When it comes to the perfect shaft flex for a golf driver, keep in mind that performing well with a regular or senior shaft is something you can easily do even if you are a high handicapper. Such shafts tend to be well suited for women golfers, senior golfers and for golfers who have a high handicap. In fact senior golfers tend to require senior grade shafts, owing to a much slower swing speed. If your own speed is anything between 85 and 95 mph then a regular shaft will work just fine for you. 12 Ways To Lower Your Handicap. And Keep It Low.